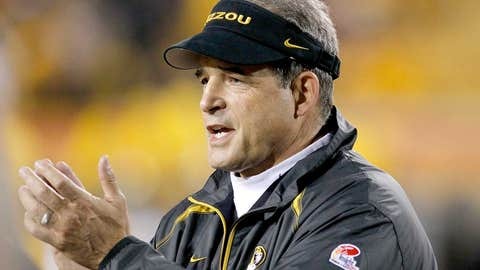 Missouri head coach Gary Pinkel, shown above in 2010, is applauding fans for their support this season. It was undoubtedly easier for Missouri fans to fall in love with the Tigers this season. After finishing 2-6 in the SEC East in 2012, the No. 8 Tigers roared back with an 11-2 overall record on way to the division title this year. Still, head coach Gary Pinkel wants fans to know how much he appreciates their energy and loyalty, and that’s why he’s letting them pick the Tigers’ uniform for the team’s Cotton Bowl matchup with No. 13 Oklahoma State. But don’t get too excited because there isn’t exactly a plethora of options to choose from. Voters can only select between a chiefly black outfit with yellow numbers or a split combination featuring a bright yellow jersey and black pants. In a video released on garypinkel.com, the coach called the fans "part of the family." He recalled the electricity at the team’s home game vs. Texas A&M and how supporters have traveled with the Tigers throughout the season. As of Friday afternoon, over 11,000 votes had been cast. The polls close Sunday evening.